Scratch, I will plan a few more stops on the bike ride this year. Looks like the Outlaw World Championship will be a 5 stage match starting at 9:00 on Thursday. This will be for the buckle and you do not have to sign up early. We will also have Outlaw in the main match following the SASS rules for those of us who always shoot Outlaw and you do have to be signed up for it. We have also used the Outlaw match on Thursday as a Warm-up match and it seems I had a lot of Black Powder with me last year. So on Thursday we have, Outlaw Match, Black Powder, Warm-up, Wild Bunch, and side matches, some kind of team match and lets not forget the Redneck Olympics. I guess what I am trying to say is BRING PLENTY OF AMMO and maybe a few extra hours for each day. So to clarify, is the Outlaw match on Thursday Black powder? If so, this could be a problem. If it is old buddy I'll bring some for ya. I think it's BP if you want it. Is there a BP only match too? Might need the cap guns. I have not heard if anyone is going to come up for the bike ride on Wednesday other than Jake, Doc and myself. Is anyone else planning on riding? We may end up canceling this year if that is all that is planning on riding. Cash'n'Ginger are planning to ride as well. Waimea, for you, yes it is Outlaw Black Powder since you are the Florida Black Powder Outlaw Champion, Wait, seems you are also the Florida Outlaw Champion also. OK, we will let you shoot any powder you want to but before you get too excited you are helping me run the Outlaw match on Thursday and you are shooting Outlaw at the main match. Titus, I understand I will see you all on Sunday evening. I am so looking forward to this match. Looks like some of us will be spending this weekend at the MT Winchester for the Battle of the Bands/Grand Opening. We'll be at Joe's either Saturday or Sunday, not quite sure yet. Either way, I'm looking forward to seeing y'all as well. Thank you, Judge. Seems smokeless is OK. I'm actually bringing a reloader with me because I have been so busy with Hillbilly Gold I ain't had a chance to put together a stage worth of ammo. TT we can work on the details this week. We will be pulling in sometime on Sunday as well. Might be a traffic jam on the driveway between me and Mrs Waimea and Titus and Cash. Leaving in the morning to shoot with the Krappy Gang in Toccoa on Saturday. Got my foot doctor appointment moved up to 8:00 am on Monday. If everything goes right, I'll be there on Monday afternoon. I'm not in any real shape to shoot, but I plan to at least get in on a couple of stages. Tombstone! I can help with the Outlaw match and would be pleased to be allowed to contribute!! Would someone explain to me why I had to go to page 2 of the wire to find this thread? Shame on us. Well, as more folks get out and head toward all the fun there's fewer of us left to keep the thread up front, I reckon. I'm packing my "stuff" to send to Black Gold with Tombstone tomorrow. I'm arriving later in the week on Thursday. I'm bring all the necessary items to CLEAN jewelry and refresh patinas (at no charge for BSJ). So....if you or anyone you know has some Bullet Splat Jewelry, bring it! And on Friday or Saturday morning, bring it to Lady T.’s RV, to be cleaned. Then stop back by after shooting to pick up your sparkling goodies! I'd like to remind everybody that I'll be bringing my hat gear. I'll be set up to clean and re-shape/touch up hats from 10:00 'til 4:00 on Tuesday and Wednesday and after the Outlaw match 'til 4:00 on Thursday. I'm planning on getting a couple of stages in on Friday, (I won't be able to shoot the whole match) and I'll try to be available for a while after that. I probably won't set up on Saturday, so plan accordingly. See y'all when ya' get there!! I think I've got Sawmill Mary talked into ridin shotgun to Black Gold but I've not got her in the truck yet. We won't be shooting but come to visit, watch and maybe do some trading. 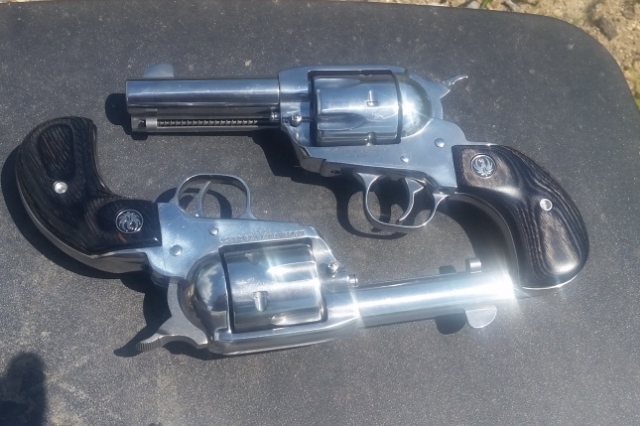 I have this pair of stainless Vaqueros in 45ACP (will also shoot C45S if loaded right) that wants a new owner. I plan on coming down Thursday morning. If I am reading things right the warm up "mini" match starts at 9:00 A.M., side matches later in the day. Am I right about the warm up match time? The times translates to drive time and sleep lol. Folks are starting to roll in and get set up. Looks like it is going to be a good one again. Whiskey Creek is putting the finishing touches on the Redneck Olympics, stages are pretty much set and ready to go. All we need now are all the good folks who will be here. I will be there sometime on Wednesday. Is anybody going to be there making earplugs? I would like to get a set made for my son who will be shooting with me. I was at the range teaching him about cowboy shooting last Friday and will be at the range with him tomorrow getting him ready for his first shoot. Gun are all working ok, and working on drawing and safety rules with him. I think he is ready and we will most likely shoot the practice match Thursday and some side matches. Still looking for a alias for him. Should be packed by tomorrow evening and leaving out early Wed morning. Scarlett will be there with Tommy......they make a great set of ear plugs....best I've ever used. Got to the range about 3:30. The place looks GREAT!!! A few of the usual suspects are already here and helping put the finishing touches on the range AND the kitchen. Joe has expanded the covered picnic area, the covers on the stages, and over the loading/unloading tables. Many other improvements, too many to mention, are already done!! Y'all that ain't comin' are really missin' out!!! Twenty to eight and I'm headed to the barn to hook up. Ky tonight, black gold on Wed. I have 3 pairs and the ones Tommy made are by far the best. I've not read every post on these topics about Black Gold match but somewhere there was talk of hillbillies and bib overalls. Sawmill Mary and I are planning to head that way tomorrow and hobknob on at least Thursday. Will bib overalls be considered proper attire? Sawmill Mary and I hung out Thursday morning with a lot of great folks at the Blue Gold match. I shot some candid camara vodeos. Here is good pard Widder showing off at the shotgun speed run. What fun!! The Hillbilly Olympics were hysterical!! I laughed so hard! No complaints! We already made our reservations for next year! The hospitality of the Jarvis family is amazing! It's a big little match! What's so nice is that everything happens right there - you get time to visit and get to know folks.... the ladies who cooked lunch/dinner were so nice and good cooks! The folks in town were friendly and happy that a bunch of cowboys had invaded Manchester, too! Thank you to EVERYONE who had a hand in another great match! Already have motel reservations for next year!! Thanks to the family of Copperhead Joe and all of the folks that worked and sweated to make this the best little match in S.A.S.S.!! Looks like I missed a goodurn. Looked at the scores....some mighty fine shooting went on. I mostly disappointed that we weren't able to make this match cuz I think I coulda won the Pelvis contest! We finally made it to Black Gold this year and I just want to say....DAYUMM! We had an absolute fantastic time. Good folks, good food, great stages and wonderful hosts and helpers. My hat is off to everyone involved in making this match the must attend match of the year. We will be back. Thank you so much to ALL the hard workers that put on the best match and make sure the shooters have fun! Boy did we have FUN!! The count down for next year has begun!! What a great shoot! Joe, Bo, family, and friends put on the best major shoot out there. Whiskey Creek's "Hillbilly Olympics" were fun for participants and spectators and Black Water and others provided great music Thank you all for all your hard work! Miss Kitty Kat and I have already made our hotel reservations for next year. Seriously, if you've never attended this shoot, your missing a good one.